Favtune Music Player has a beautifully designed interface for people who want an elegant and intuitive free, and also ads-free music player. It requires just a few clicks for navigation, and has six separate channels where you can set any song, artist, album, playlist or folder. 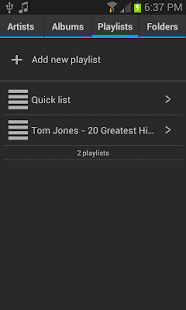 Each channel acts like a separate music player, and the main settings and playing history are stored per each channel. It looks just as fantastic in its own way, and the chances are pretty high that you will like this music player. If you have any suggestions or problems, please send us your feedback at mp.android.contact@gmail.com, so we can make it better together. Thanks!